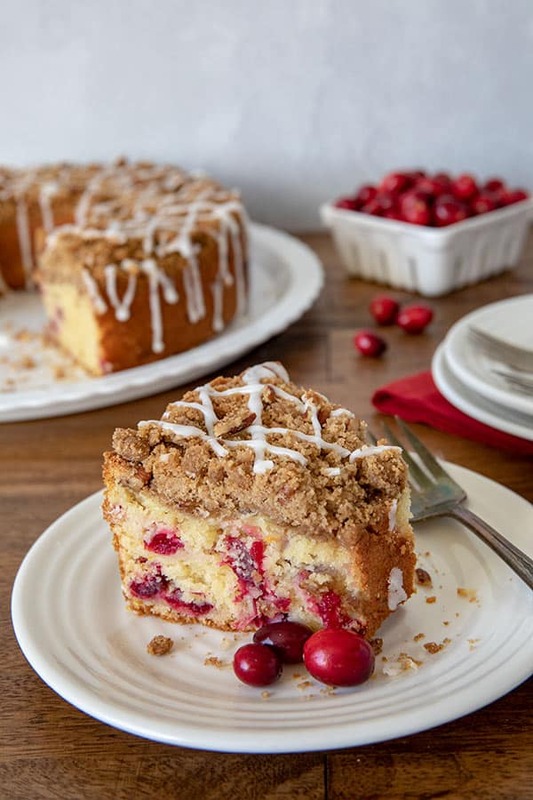 This Cranberry Orange Crumb Cake is loaded with tart cranberries, a brown sugar crumb topping, and drizzled with a sweet orange glaze. 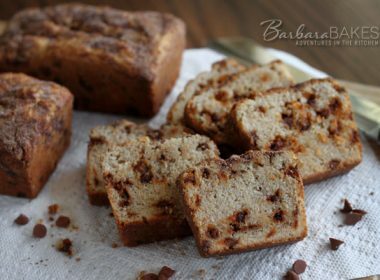 It’s a fabulous coffee cake that’s perfect for breakfast, dessert, or a snack any time of day. 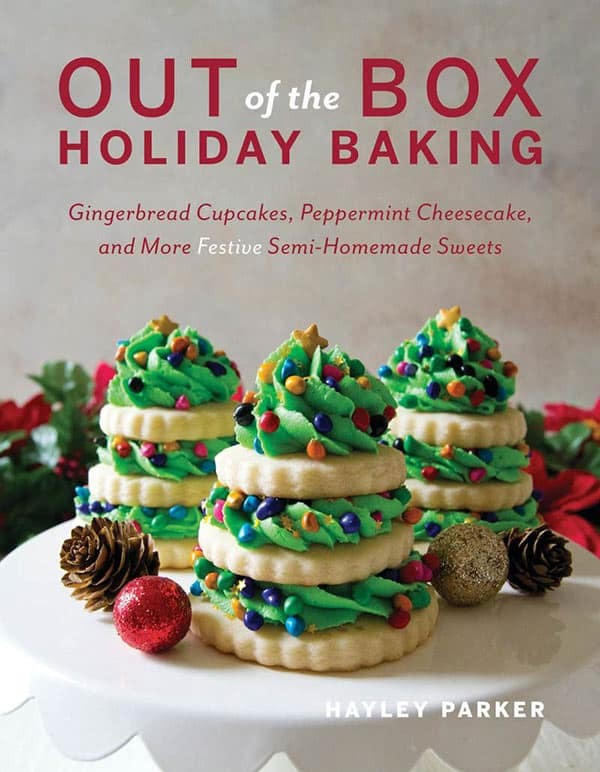 This recipe is from a fun new cookbook Out of the Box Holiday Baking, written by my sweet friend Hayley Parker, who blogs at The Domestic Rebel. This is Hayley’s third dessert cookbook. Hayley’s Out of the Box concept is to start with a boxed mixed or other convenience ingredients, and turn it into an extraordinary dessert. 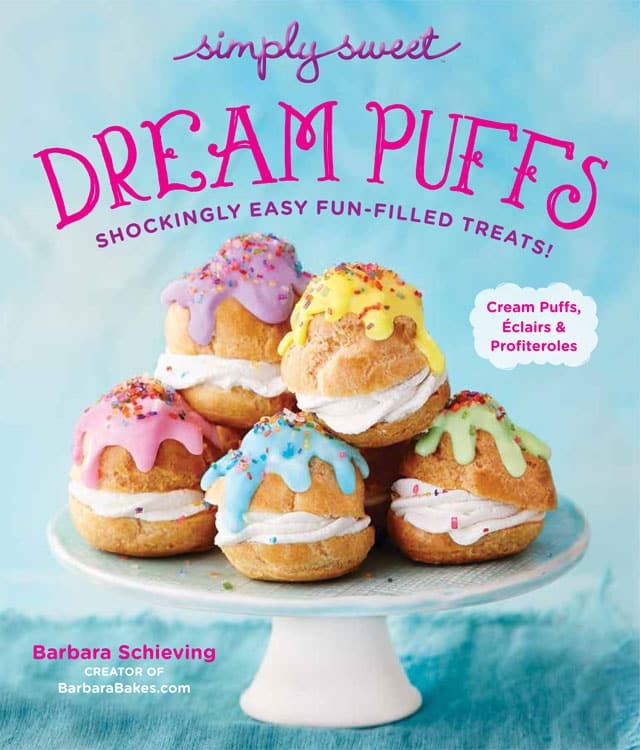 There were so many fun treats in the cookbook, it was hard to choose which one to bake first. The Polar Bear Cookies are super easy and adorable. The Sugar Cookie Christmas Trees on the cover would be so fun to make and decorate with kids. 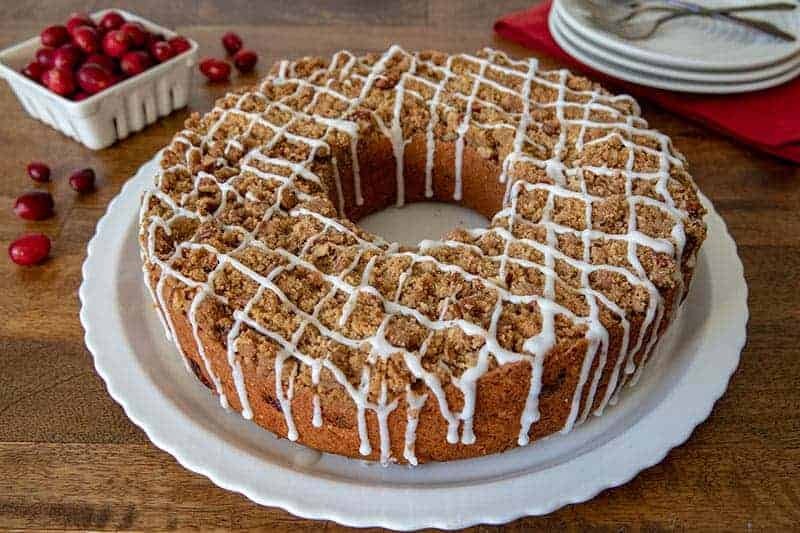 This coffee cake is loaded with tart fresh cranberries you could use frozen if fresh cranberries are out of season. 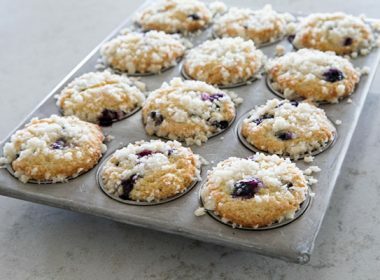 Hayley recommends adding frozen berries to the batter without thawing. You can also used dried cranberries instead of fresh cranberries. The cranberry flavor wouldn’t be as prominent but it would still be a great coffee cake. The original recipe used a 9-inch springform pan. 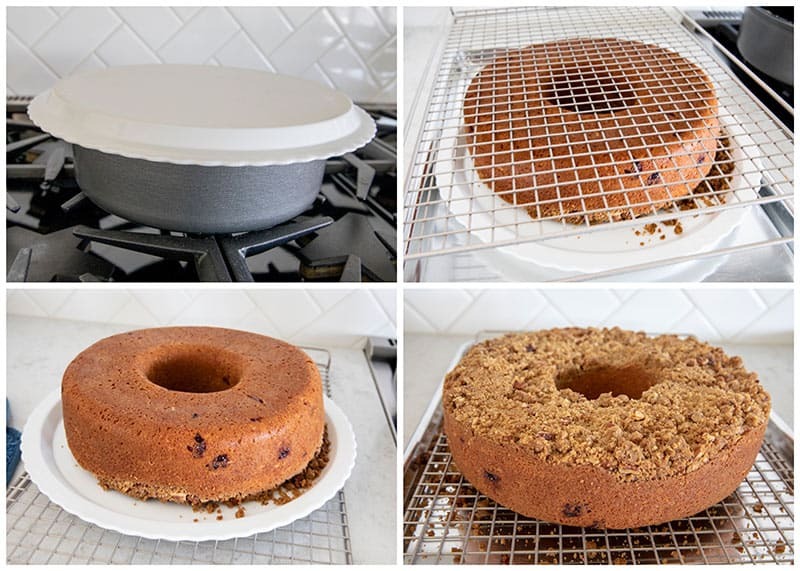 But since I have a coffee cake / tube pan that I love, I decided to switch it up and make it in my coffee cake pan. 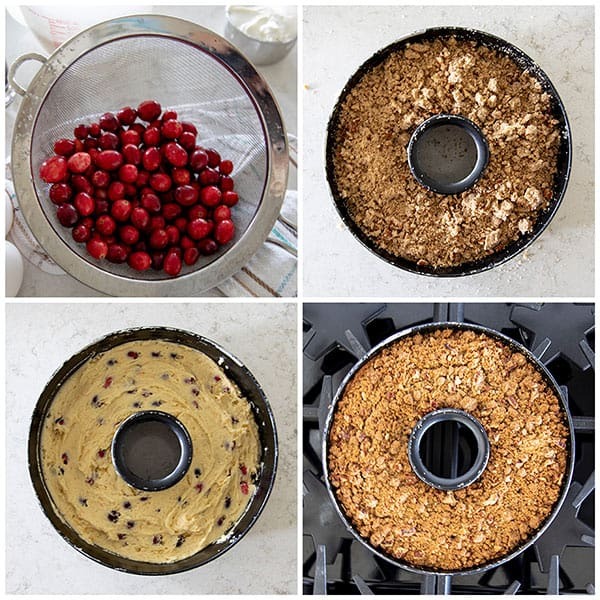 It can be a little tricky turning the cake out of the pan the first time you try it. So I took the above step by step photos of how to do it. 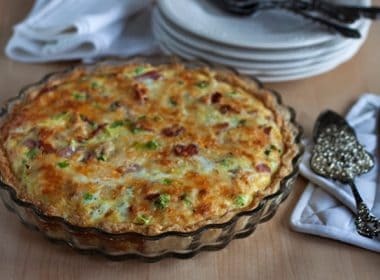 Use a rimmed baking sheet to catch the crumbs that fall off. 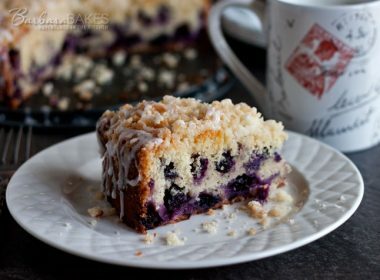 Of course, if you prefer, you can serve the coffee cake right from the pan. After you’ve turned the cake out of the pan onto a serving platter, you’ll drizzle the top with a sweet orange glaze. 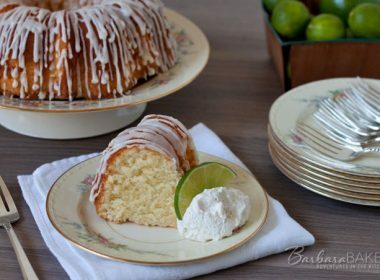 You can spoon the glaze over the top of the cake. However, I love to decorate the top with a fun pattern. I’ll fill a Ziploc bag with the glaze. Snip off a corner of the bag and drizzle lines across the top of the cake. Put a little puddle of the glaze on the edge, so it can drip down the side. If the glaze doesn’t drip down, your glaze may be a little too thick – add just a little bit more liquid. If it runs down the side too quickly, just add a little more powdered sugar to the glaze. You can do a test drip on the edge to see if your glaze is the right consistency before putting the glaze in the Ziploc bag. My family loved this crumb cake. It was moist and tender and flavorful, with just the right amount of crumbs on top. I’m sure your family will love it too. 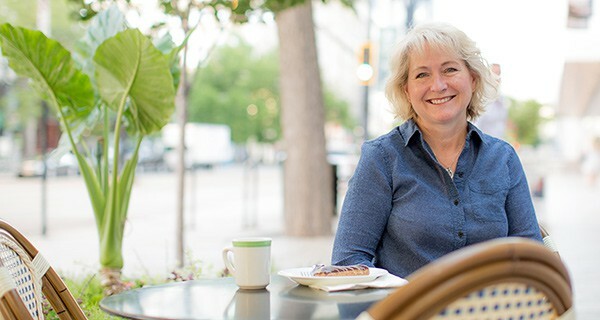 Be sure and check out the other recipes I’ve posted from Hayley’s first two cookbooks, M&M Cookie Dough Brownie Bomb Cake, and Joyful Almond Macaroons. Prepare crumb topping: In a large bowl, combine the brown sugar, flour, cinnamon, 8 tablespoons melted butter and stir until moistened. Fold in the chopped nuts. Set aside. Prepare cake batter: In a small bowl, whisk together flour, baking powder, baking soda, and salt and set aside. 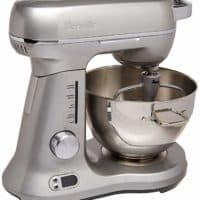 In the bowl of a stand mixer, cream together the butter and sugar until light and fluffy, about 2 minutes. Add in the eggs, one at a time, beating well after each addition. Mix in the vanilla extract, orange zest, orange juice, and sour cream. Add flour mixture and mix just until combine. Fold in the cranberries. Pour the batter into the prepared pan. Crumble the crumb mixture evenly over the cake batter, covering it completely. 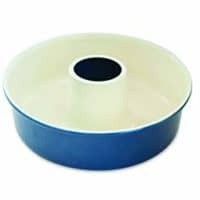 Bake for 60-75 minutes or until a toothpick inserted in the center of the cake comes out clean or with moist, not wet, crumbs. Cool completely. Just before serving, whisk together the glaze ingredients until smooth. Drizzle over the cake, then release the cake from the pan and cut into slices. 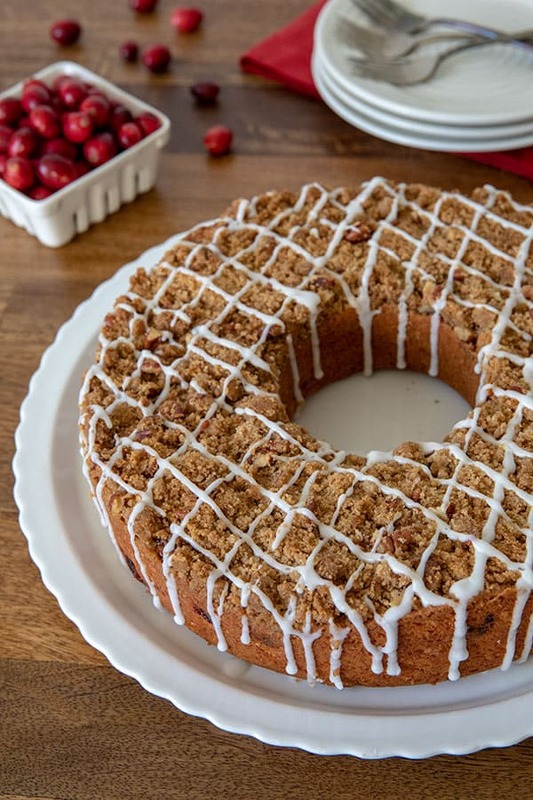 I love coffee cake and fresh cranberries. I am looking forward to baking this weekend. Hello: When I click on the link for your friend’s blog, it takes me to your Macarons page and not to her site. Thanks for the heads up Brian – I’ve fixed the link now. I’m sure your glaze would look awesome. 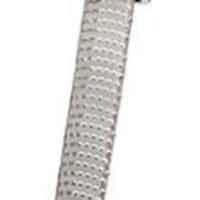 I know you’d love it. It would be perfect for Christmas morning.